A fourth annual commemorative vigil to remember individuals killed by police officers will be held in Montreal on Oct. 22. The vigil is being organized by the Justice for Victims of Police Killings Coalition, a working group of Concordia University’s chapter of the Quebec Public Interest Research Group. The coalition is composed of the family members and friends of individuals killed during police actions and interventions, said Julie Matson, one of the vigil’s organizers. Matson’s own father died in 2002 after allegedly being beaten by Vancouver police officers. “We want people to know that [people die] in these horrible, violent ways and that we have to look past things like race, class and gender,” Matson said. “Don’t judge a book by its cover. Everybody is a human being who deserves respect. “It’s everyday normal people that this happens to, and not just these criminalized people that the media or the police give us the [impression] of,” she continued. Michael Arruda, a spokesperson for the Service de police de la Ville de Montréal and an advisor to the police administration on mental health issues and crisis intervention, told The Link the first priority for police officers is always to try to defuse the situation. Last year there were six incidents in which Montreal police officers used their firearms, with a total of 10 shots being fired, according to the SPVM’s 2012 annual report released on May 8. In total, six civilians were wounded, including two deaths. No police officers were wounded or killed in the incidents. On July 26, Robert Hénault, 70 years old and armed with a knife, was shot by police officers, eventually dying two weeks later in hospital, on Aug. 8. In January 2012, Montreal police shot and killed Farshad Mohammadi, a 34-year-old homeless man who had immigrated to Canada from Iran, in the Bonaventure Metro station. Mohammadi had cut an officer with a blade, according to police. Montreal police also shot and killed 40-year-old homeless man Mario Hamel and 36-year-old bystander Patrick Limoges in June 2011, in an incident that raised questions about whether officers are too quick to use their weapons and whether they receive adequate training on how to deal with marginalized individuals, such as the homeless and the mentally ill.
Arruda said the SPVM has three different levels of crisis intervention teams. First, psychologists or mental health workers from outside the police service can be called in to advise police officers on whether an immediate danger exists in different situations, he noted. Arruda also said there are mixed forces where a police officer works hand-in-hand in the same patrol car with a crisis intervention worker who is not a police officer, responding to calls in order to evaluate and diffuse situations. Finally, some police officers have been trained in crisis intervention, according to Arruda. “By the end of 2014, we should have close to 200 police officers who are trained in crisis intervention,” he said. In addition, an intervention team works with the homeless in a more preventative way, trying to help people to get off the street, while every police officer receives some training—in the form of simulation calls—in how to handle cases which might involve mental illness or people in crisis, he continued. “The biggest problem we have, with the police, is how to detect somebody who’s in a mental health crisis,” Arruda said. “Once we’ve detected that it’s a mental health issue, once we’ve detected that it’s not a criminal behaviour problem but rather that it’s because of their mental state that the person is behaving [a certain] way, then what would we do? “What we’re trying to do with all of these special teams is to [allow police officers] to access all of these teams that are available to come, help them out, support them, and advise them on what the best procedures are,” he continued. Matson said she thinks police officers need to receive more training on how to deal with mental health issues, as well as compassion and sensitivity training. She doesn’t believe the SPVM’s recent initiatives do enough. “Having a token person on staff [who is a mental health worker] is not enough to actually make a difference, and having weekend training is also definitely not enough to make a difference,” she said, adding that it might be beneficial if police forces looked to recruit older people with more life experiences, instead of young cadets. For Matson, the road to better policing lies in taking the more drastic step of disarming police and finding new ways of intervening in different conflict situations. “With more guns out there in the world, there’s going to be more violence caused by guns. It’s just simple math,” she said, adding that it doesn’t matter whether the firearms are in the hands of police officers or members of the general public. According to the BBC, police officers working at all major police forces in the U.S., Canada, Australia and most of Europe carry firearms by default. Police are unarmed by default in only a handful of nations, including Britain, Ireland and New Zealand. In Norway, officers usually keep firearms in their patrol cars, but not on their person. In Britain, there are armed response vehicles on patrol that could respond to particular types of emergencies that require armed police officers. 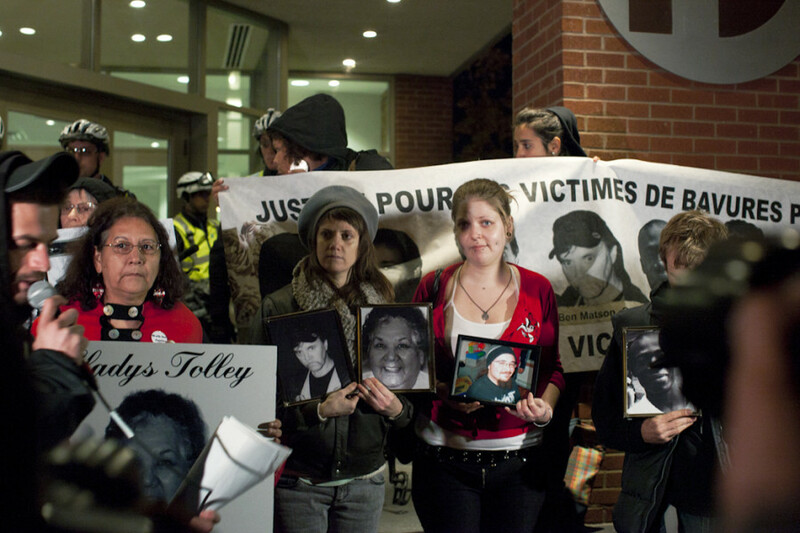 The vigil set to take place on Tuesday is also demanding that the Quebec government provide “truly independent inquiries” into police actions leading to civilian deaths, according to the Justice for Victims of Police Killings Coalition’s website. Stéphane Bergeron, the Quebec Minister of Public Security, tabled Bill 12 in the National Assembly last year. The bill, which was passed on May 9 of this year, will create a new civilian organization to investigate incidents involving police that result in civilian injuries or fatalities. Once set up, the organization will be made up of civilians and not acting or retired police officers, according to the Quebec Bar Association. Currently, when a civilian is injured or killed during a police intervention in Quebec, an external police force will be brought in to investigate. The provincial police force, the Sûreté du Québec, is often tasked with investigating incidents involving Montreal police, for example. According to the Montreal Gazette, the new civilian investigative body probably won’t be operational for another year-and-a-half to two years. The vigil is set to begin at 6:30 p.m. on Oct. 22 outside the Police Brotherhood at 460 Gilford St. CORRECTION: The original version of this article stated that Bill 12 was passed in the Quebec National Assembly “on May 9 of last year.” In fact, it was passed on May 9, 2013. The article has been updated accordingly. The Link regrets the errors.